Wrist fractures are a very common type of orthopedic injury. They occur most often as the result of a fall. When we fall, it is our natural instinct to stretch out our arms in an attempt to cushion ourselves. However, this causes our full body weight to land on our wrists. There are several types of wrist fractures that can result from a fall or other source of injury. The type and location of the wrist fracture determines how it is treated. Our wrist has many joints grouped into the Midcarpal Joint and the Radiocarpal Joint. The joints are composed of several bones in our hand and two bones in our forearm. The wrist joints function to position our hand and fingers for movement. The two bones in our forearm and three bones in our hand form the Radiocarpal Joint. The bones are connected by muscles and ligaments, which can change the shape of the hand and move the wrist. The primary motion of the Radiocarpal Joint is to lower the hand and wrist downward and move it towards the little finger side. We use this motion to grip objects, such as holding on to the handlebars of a bicycle or a steering wheel. The Scaphoid and the Radius bones are the two most common places for fractures. The Radius is the widest bone in our forearm. It is located on the thumb side of our forearm. The Scaphoid is a small bone in our hand. It is located on the thumb side of the wrist. 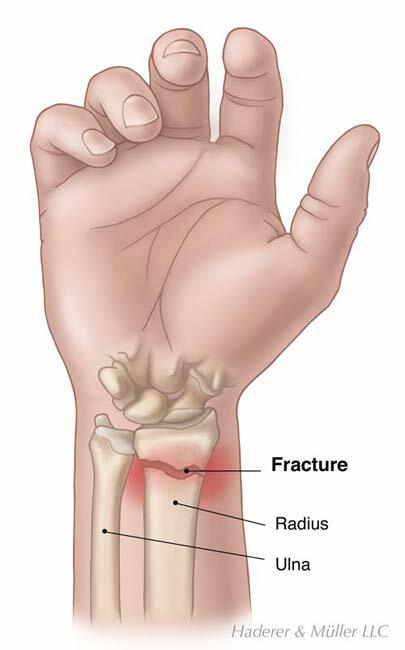 Wrist Fractures most often result from a fall on an outstretched hand. As we fall, it is our natural instinct to stretch out our arms in an attempt to cushion our bodies. However, by doing so, we cause our wrist to receive two forceful impacts. The wrist contacts the ground first, followed by a second impact of the full weight of our body. There are several types of wrist fractures that can result from a fall or other source of injury. The type and location of the wrist fracture depends on position of the wrist during the impact. Scaphoid fractures occur more commonly in men between the ages of 20 and 40 years old. Scaphoid fractures are less common in children and older adults. Falls are the most frequent cause of Scaphoid fractures; however, they are also a common injury from sports and motor-vehicle crashes. During impact, the Scaphoid will fracture if the wrist is flexed (bent) at a 90 degree angle or greater. Radius (the widest bone in the forearm) Fractures, also called Colles Fractures, are very common among older adults. Older women with Osteoporosis, a bone weakening disease, are at the highest risk. Wrist fractures can also occur in children. Children’s bones are soft and tend to buckle when they break a fall. These types of fractures in children are called Torus Fractures. 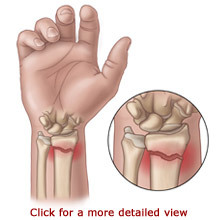 Symptoms of a Scaphoid Fracture can be mild and differ from person to person. A Scaphoid Fracture may cause a little swelling but no obvious hand deformity. You may think that you just sprained your wrist. However, a Scaphoid Fracture can also cause swelling, pain, or tenderness on the back of the wrist near the thumb side. Your pain may increase during gripping activities. Some people experience a deep dull pain that comes and goes during rest. You may feel tenderness when pressure is applied to an area called the Anatomical Snuffbox. The Anatomical Snuffbox is a small cup-like depression located on the back of the hand at the base of the thumb. Colles Fractures can be painful and include swelling just above your wrist. You may not be able to lift or hold lightweight objects. Your arm may appear deformed just above the wrist, because of the backward angle of the fractured bone. You should see your doctor as soon as possible if you think you have fractured your wrist. Your doctor will make a diagnosis by examining your wrist and asking you what has happened to cause the injury. X-rays will be ordered to provide a good picture of your bones. In some cases, doctors may order Computed Tomography (CT Scans) or Magnetic Resonance Imaging (MRI Scans) to get a better view of the wrist structures. These imaging tests are also painless. They require that you remain very still while a camera focuses on your wrist and takes images. CT scans provide a view in layers, like the slices that make up a loaf of bread. MRI scans provide additional detail of the soft tissues. Wrist fracture treatments are very individualized and differ from person to person. The location and type of your fracture will determine what treatment is appropriate for you. Many fractures can be treated without surgery. Many Scaphoid Fractures are treatable with casting. However, with modern methods, surgery is generally considered the treatment of choice. Casting is used to hold your bones in proper placement while they heal. The cast is usually worn from six weeks to six months. Most Colles Fractures can be treated with casting or splinting. The cast or splint is typically worn for about four to six weeks. Surgery is recommended for fractures that do not heal properly or when the bones have broken in such a way that they are unlikely to remain aligned when set with a cast. There are a few options for surgery. The type of surgery that you have will depend on the location and type of your fracture. You can be sedated for surgery or your doctor can numb the area with a nerve block. Surgical options include procedures called an Open Reduction and Internal Fixation or an Open Reduction and External Fixation. Open Reduction and Internal Fixation refers to techniques that use surgical hardware to stabilize a fracture beneath the skin. Your surgeon will make an incision and place your bones in the proper position for healing, then secure the bones together with surgical hardware, such as pins, screws, or metal plates. Open Reduction and External Fixation refers to techniques that use surgical hardware to stabilize a fracture from the outside of the skin. 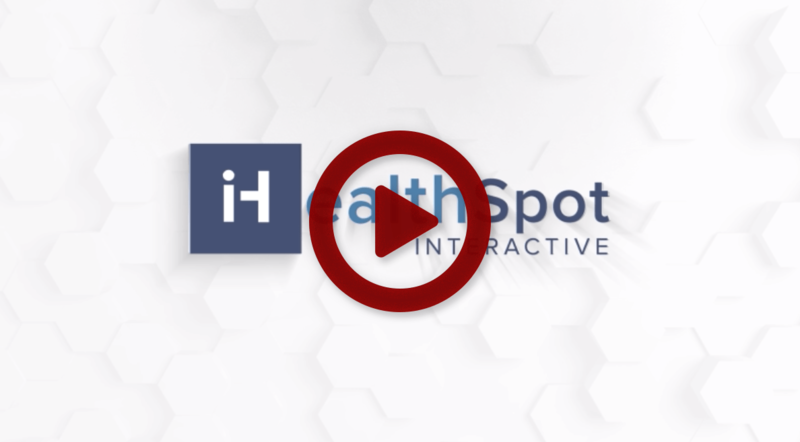 Your surgeon will make an incision and place your bones in the proper position for healing, then secure the bones with surgical pins that are placed through the outside of the skin. The surgical pins are attached to a metal frame on the outside of the wrist. Physical or occupational therapy follows surgery or casting. Your therapists will work with you to regain movement, strength, and function of your wrist. Recovery time from a wrist fracture is different for everyone. It depends on the type of fracture you had and the type of treatment you received. Your doctor will tell you what you can expect. Generally, wrist fractures take several weeks to heal. Full recovery of motion and strength takes several months. Most people have good outcomes and regain good use of their wrists. There are several things that you can do to help prevent falls and decrease your risk of sustaining a wrist fracture. A general physical examination could identify medical conditions that are associated with balance disorders or dizziness. An early diagnosis may allow for optimal treatment. It can be helpful to have an occupational therapist, a physical therapist, or a family member help you examine your home and remove obstacles that may cause you to trip. It may be helpful to install railings on steps or in your shower. Low-heeled sturdy shoes may help you maintain proper foot positioning. A cane or walker may aid your balance while you stand or walk.